SPOKANE, Wash. — For this University of Hawai’i men’s basketball team that has been up, over and around a long mountain range of adversity, it has always been as much about the journey as the destination. Those two worlds have now climactically connected, as the Rainbow Warriors’ long, tumultuous but inspiring journey has brought them to the Promised Land, now identified as Spokane, Wash. — site of Friday’s 8 a.m. (Hawai’i Time) NCAA Tournament first-round game against California. 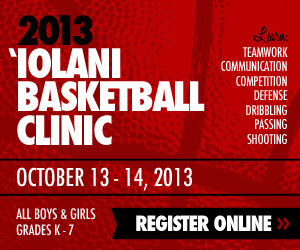 The game will be televised live nationally on TBS, and the UH players are determined to keep the journey going. Hawai’i (27-5) is the No. 13 seed in the South Region, while Cal (23-10) is seeded No. 4. But the Golden Bears are well aware that the Rainbow Warriors’ story and makeup go far beyond records and statistics. In the past 17 months alone, most of the UH players have worked under three different head coaches with varying styles/personalities/philosophy, watched three key teammates (Isaac Fotu, Negus Webster-Chan and Isaac Fleming) leave the program prematurely, and weathered the storm of an NCAA investigation and eventual punishment including a 2017 postseason ban. That’s on top of other usual obstacles like injuries, team chemistry and tough conference scheduling. Through it all, the Rainbow Warriors endured and overcame, and eventually journeyed to this coveted destination. With two sudden developments this week, how Cal will perform has almost become a bigger question. The Golden Bears are regarded as talented but youthful and showed flashes of brilliance this season, but on Monday assistant coach Yann Hufnagle was fired after allegations of sexual harassment against a female reporter surfaced. 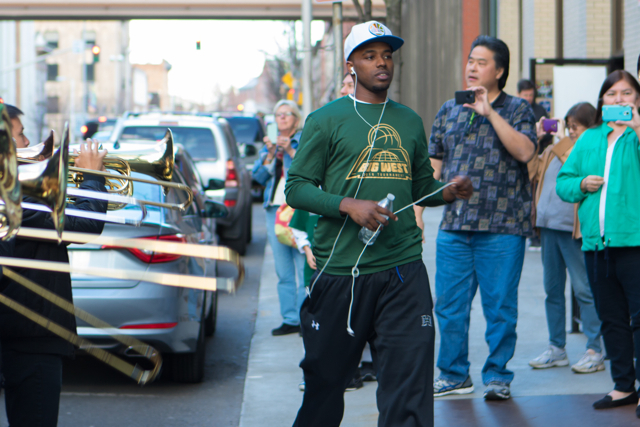 The on Wednesday, starting point guard Tyrone Wallace, a senior who was averaging a team-leading 15.3 points and 4.4 assists per game, suffered a broken bone in his right hand after a freak accident at practice. Wallace has been declared as unavailable for Friday’s game and will be replaced by backup Sam Singer (3.5 ppg). Hawai’i coach Eran Ganot cautioned against thinking Cal is any less a challenge without Wallace. Ganot said total preparation — “not just X’s and O’s” — has been key the Rainbow Warriors’ success this season. Ganot and the UH players had equal praise for their fans, who showed up in force during last week’s Big West Tournament in Anaheim, Calif., and are expected to make their presence felt in Spokane Veteran’s Memorial Arena on Friday. 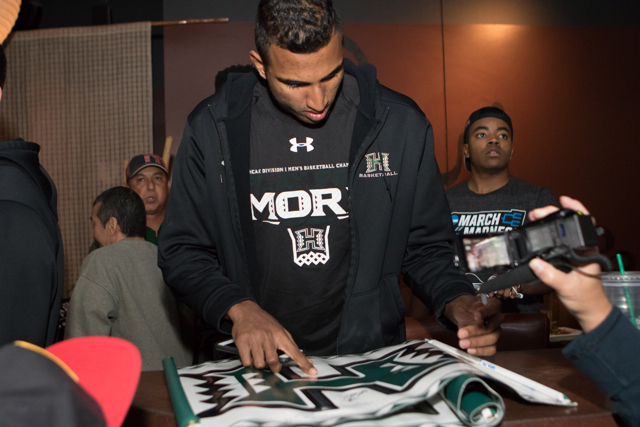 About 50 or 60 UH fans, plus the Rainbow Warriors’ band and cheerleaders, greeted the team loudly and warmly at The Wave Island Sports Grill and Sushi Bar restaurant in downtown Spokane as it arrived for dinner Thursday night. Earlier in the day, junior wing Aaron Valdes said the fans’ journey has paralleled the players’, and then the players were greeted and cheered during a 40-minute workout on the Arena floor. 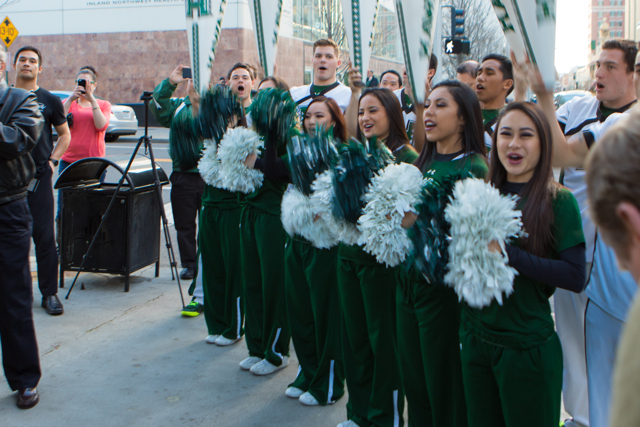 The Rainbow Warriors will have arrived at their destination Friday, making their first NCAA Tournament appearance in 14 years. But will the journey continue? Ready for tomorrow! See everyone at the game! Wes or Dayton, I’m curious if Jack or Jakob are being flown out to Spokane? Arizona, Colorado, and USC all lost today. Only Utah saved the Pac 12. What will Friday bring? This is not the Big West so everybody in the NCAA tournament are either a champion, a ranked team, have a terrific record, or are highly rated in their conference. So, UH will have to play at a higher level and be very efficient. Ganot has learned very well. Will Cal. be more dangerous like a wounded dog, or are they already devastated. Talent wise we are overmatched, so what gives Hawaii a chance is teamwork and doing the little things. I won’t make a prediction, but I am excited to see what happens. Let’s pray! Our guys go much stronger in non-conference games against very good teams on big stages. Wes made it there, too. Ahhh, WarriorInsider coverage at its finest. Great videos. Again, mahalo to the Schmidts. Tipoff in about 10 hours. Breakfast and basketball. Ought to be fun. Love the videos and the interviews with the players. Ganot speaks really well, he was great at the press conference. That was a great read, Bernie, thanks! Rod said his dad was “trying to get up here.” Sure hope you make it, Mr. Bobbitt. I loved Rod especially in the press conference and he said “we came here to win games”…plural…gameS. I love that attitude! The hardest thing about playing early will be how hard it will be to fall asleep tonight. But I guess that goes for both teams. Go Bows!! Guess the next posts will be after the game. Go TEAM, you’ve earned it! wt….jakob and jack not there! team, trainers, band, cheersquad and coaches families all there and not two players. UH that is poor form – show some integrity! Go boys you deserve it, all of you even those who are not there!!!!! just looked on footage and cant see Jakob or Jack Basketball Austrlia site says he is there so maybe he is! Surely Ganot would not leave him home especially with Issac no longer with the team! OAKLAND, sure hope you make it up here. You are welcome to stay at the home I rented. Awesome experience for the players and fans! Excited for todays game! The Bows look ready! Wish Artie and Kanoa were commentating! Ok guys let it all hang out today. Big Mike, say it again, Big Mike, he da BEAST! Who da Q Q Q Q? And these men with Coach Ganot are gonna slay da Bears! These videos are awesome. Go Bows, Bring it today. Sitting with Jack and jakob!! They came up on their own, as fans!!! What great teammates!! Unless there’s some reason, some NCAA rule that doesn’t allow Hawaii to pay for Jack and Jakob to be with the team, shame on the UH administration! If AP is there, shame shame shame. If I were a UH administrator who was invited to make the trip, I would give up my ticket to have these boys go. If the coaches are hoping to create an Australian pipeline, this is certainly not the way to do it. Leaving Jack and Jakob out of such an important event would ring alarm bells for any potential recruits that all may not be what it seems. What difference would it make to have extras on the bench? UH is better team. Cal key guys out and one major foul trouble. Cal no better than Irvine. Warriors will pull away by double digits. Warrior team so smart will run their offense to perfection. Game Over. UH wims by 10 or more. Hawaii is moving on. I think they have chance to win south. They are hot and Team First. Go Bows!! Warriors elite eight? They have everything going. Plus no fear. What is it? Maybe last time ncaa for a year.Go Bows!! It’s not the end. It’s just the beginning. Go BOW !!!! Whooo Hooo ! They can beat all teams in field. Can warriors get to final four? My included in final bracket. Just on team most hot and smart. Warriors this year’s Wichita St. or Butler. They have 3 wins to go. Then on to Houston.Quincy leading team again. Key. He is unsung MVP for entire season. Favorite player of past 3 warrior head coaches. His legacy being part of about 75 to 77 wins. We can beat Maryland tomorrow. We came close to beating Oklahoma early in the season but couldn’t finish. We’ve gotten better since then – we’re more mature and we know how to close out games.